Soldier's Letter, 3 1/2 pages, 4to., Hilton Head Port Royal, November 12th, 1861. 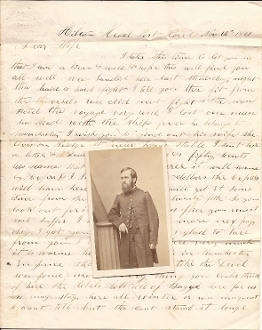 Jonathan R. Bagley (Co. K, 4th New Hampshire Infantry) writes to his wife. "...the ground left covered with the dead and wounded from the woods & in the fort our side lost eleven tha lost two hundred & all the property on the island...we have got two hundred Negroes slaves in the quarters..."
Some aging and fold splits, otherwise fine. Comes with the CDV.